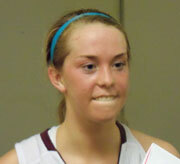 Western Christian pulled out to an early lead and went on to down North-Linn 69-52 in a Class 2A semifinal. “That was a good start, we came out and played well together and played our ball,” Western Christian and junior forward Jamie Gesink says. The Wolfpack will seek a third straight championship. “It feels pretty awesome to have another chance to go in there and defend our title, I’m just super excited to go for it again tomorrow night,” Gesink says. Western Christian hit nine three-pointers, something coach Bill Harmsen says they were expecting to get some long-range shots. “We thought Payton (Harmsen) and Erika (Douma) would get some looks and they did, and fortunately they dropped,” Harmsen says. Douma was 6-12 from three-point range, and Payton Harmsen was 3-4. North Linn coach Brian Wheatley says they knew they had to try and score each time down. “We kind of talked about it going in, before we played these guys, you are going to have to finish every opportunity you have because they are going to be hard to come by and they have so many shooters,” Wheatley says. North- Linn ends the season at 24-1. Western Christian will face Hudson in the 2A championship Friday at 8 pm.